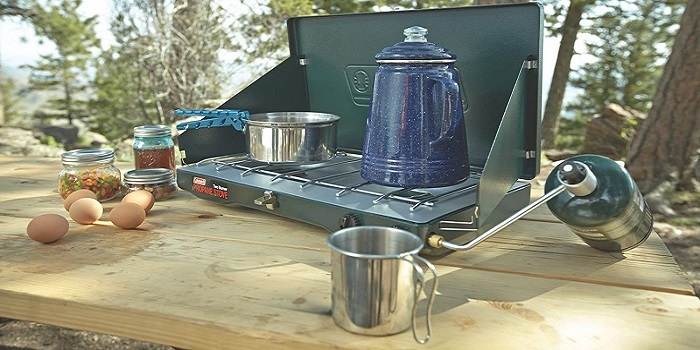 Finding the best camping backpacking stove can be a stressful task. 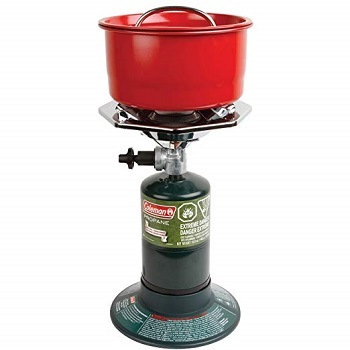 • Canister or integrated stove system – perfect for summer backpacking. 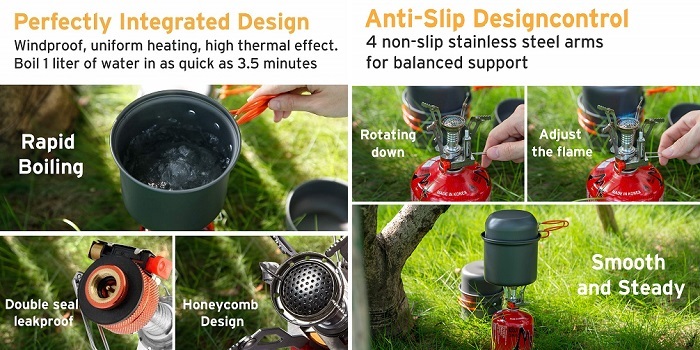 • Liquid-fuel stove - perfect for winter or high-elevation use. 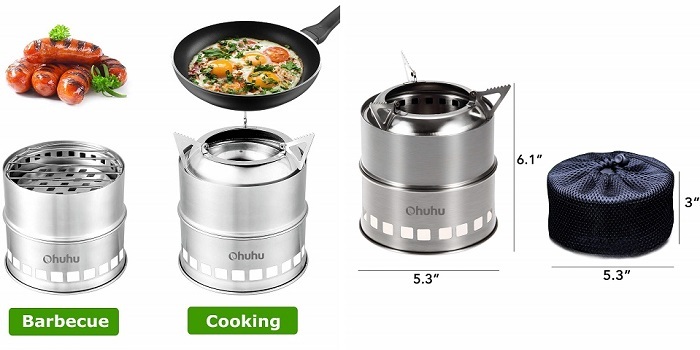 • Integrated stove system (canister) - to boil water only. 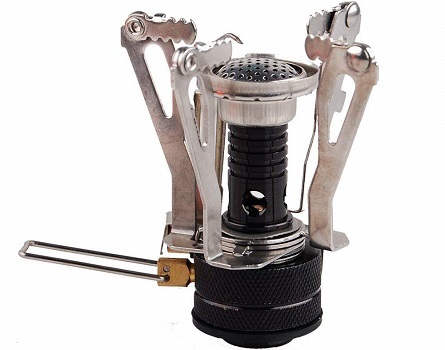 • Canister or alternative-fuel stove - perfect for ultralight backpacking. 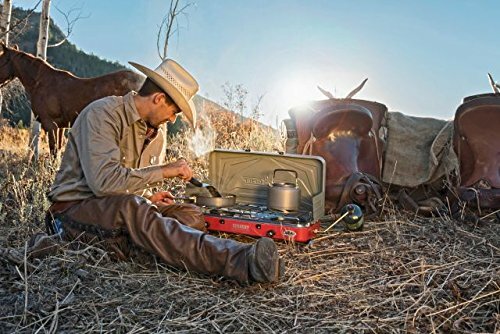 • Liquid-fuel stove - perfect for large groups. 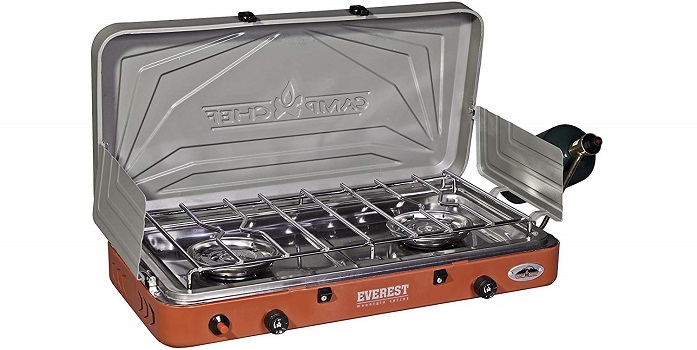 • Any model with flame control and a stable base - perfect for "Gourmet" camp cooking. BTUs (British Thermal Units), are the amount of energy that is required to heat or cool one pound of water by one degree Fahrenheit. 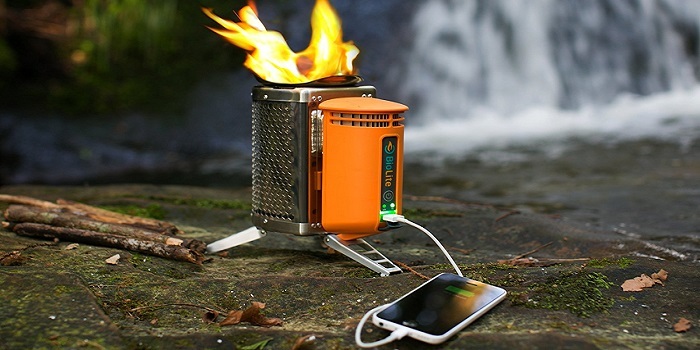 So the more BTUs a camping stove have the more power you get. 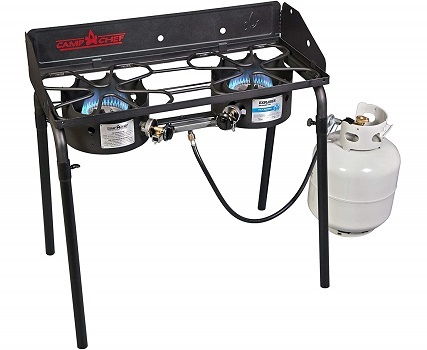 • Propane - cheaper, more accessible and easier to use. They are also lit instantly, burn clean, and requires no pumping. However, it becomes inefficient when its canister gets close to empty. • Butane - more stable than propane at ambient temperatures, which allows the gas to be safely stored in a lightweight canister. But the cartridges deplete very quickly (need to have a good supply on standby). 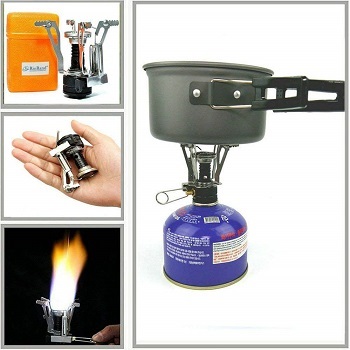 • White Gas - produce the most heat of any camping stoves. It burns cleanly without any odor or effect on food taste. • Auto ignition (piezo style). 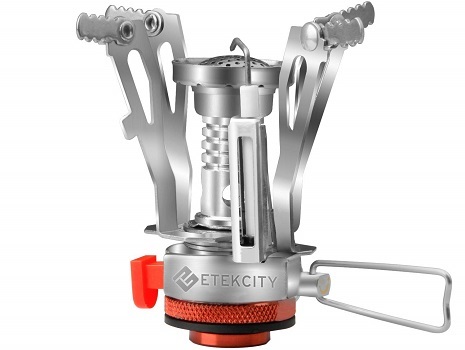 Etekcity CampStove01 delivers 1.680 kilocalories / 1.94kW / 6.666 BTU of output and accommodates up to 7"(18cm) diameter pot. 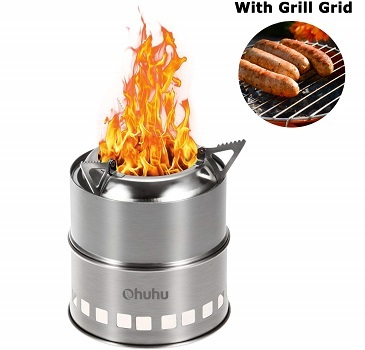 It comes with Piezo Ignition system for a quick ignition and a strong valve connection so the flame stays consistent and strong. While the foldable design makes the original mini furnace body save up to 50% of space. • Flame stays consistent and strong. 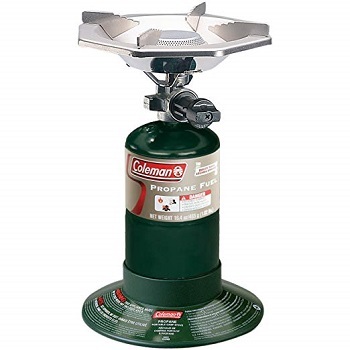 Coleman Classic 2000020943NP provide pressure control technology keeps the heat steady for consistent performance, even in cold weather, high altitudes, or when fuel is low. It facilitates a complete fuel combustion process, delivering more effective cooking heat to your food with less fuel. • Can be used in windy conditions. • Effective windscreen to save fuel and cook faster. • No ignition system & carrying handle. 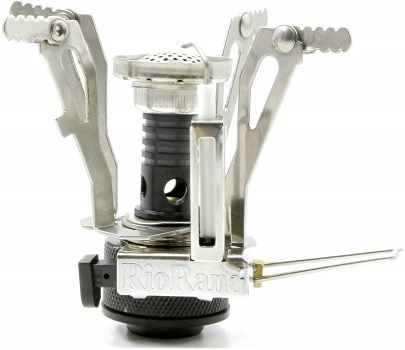 Icetek RioRand works with any screw top butane/propane canisters has a fully adjustable flame. • Doesn`t include gas base. DragonPad is made of copper metal and stainless steel with Piezo Ignition for quick ignition. • Arms once open, little short on base coverage. • Over several use of the arms, the stem becomes loose. 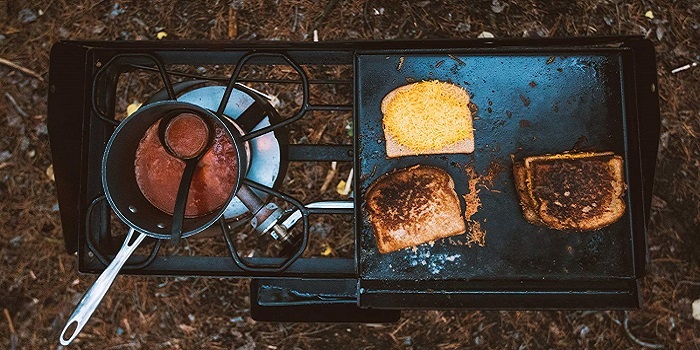 Camp Chef EX60LW Explorer provide for 15 hours of cooking time on one 20 lb propane tank gives you the ability to prepare anything from bacon and eggs to grilled salmon or even Dutch oven dinners. • Can cook in windy conditions. • Can be placed on uneven surfaces. • Not suitable for slow cooking. • 2-aluminum burners - hghly efficient "blue flame" burners with output of 30,000 BTU each. Coleman Bottle Top offers up to 10,000 BTUs cooking power allows you to brew coffee, cook hot dogs, and so on. It comes with PerfectFlow technology keeps the heat steady, even in extreme conditions, and a large base offers stability for easy stirring. • Does well in windy situations. • Super simple to attach to the propane tank. • The internals of the valve mechanism are all plastic, feel loose. 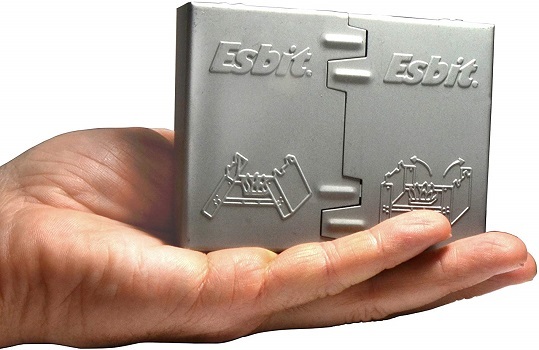 Esbit constructed from durable, electrolytic galvanized steel that resists corrosion, designed to survive many years of use. It boils 500 ml of water in about 8 minutes and folds compact enough to fit in a pocket. • The hinges operate silently. • Has a fishy smell when burning. Ohuhu uses twigs, leaves, pinecones, wood, or solidified alcohol tablets as fuel and designed to distribute heat evenly. • Easy to assemble or disassemble. • When evergreen wood burns, it creates pitch, a black sap that gets on everything. 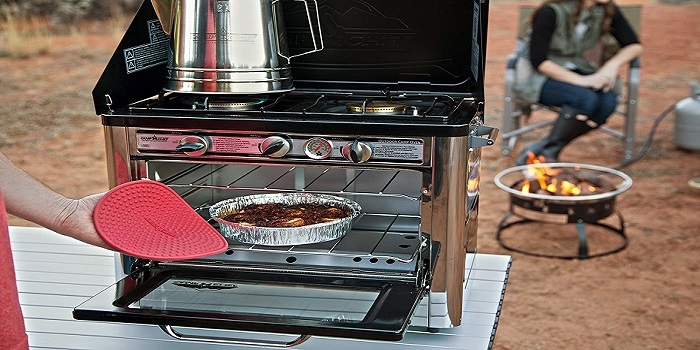 Camp Chef Outdoor Camp Oven comes with two 7,500 BTU propane burners on the rangetop take care of dinner, while the 3,000 BTU/hr oven heats all the way up to 400 degrees to bake casseroles, cookies, muffins, and other delicacies. • Pretty good temperature control. 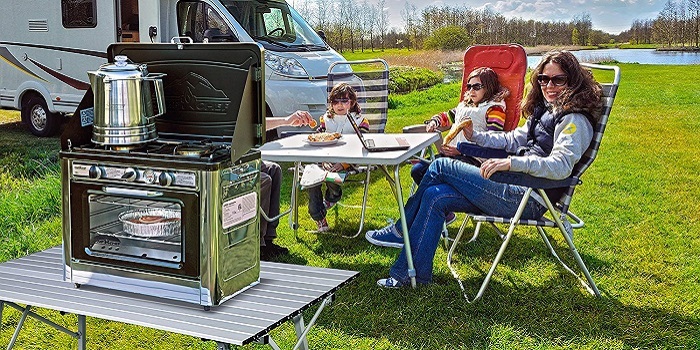 • The wind screen around the top burners is protection from only the lightest breeze. Camp Chef MS2HP comes with two 20,000 BTU burners pump out all the heat you'll need to handle your cooking needs and feed your family. For ease of use, the Piezo igniter sparks the stove to life with a push of the button, eliminating worries about wet matches and burning your hand. • Igniter lights on first strike, every time. • No handle, or easy places to grab.